Researchers of the HZDR, an independent German research laboratory, studied an alloy of iron and aluminum. 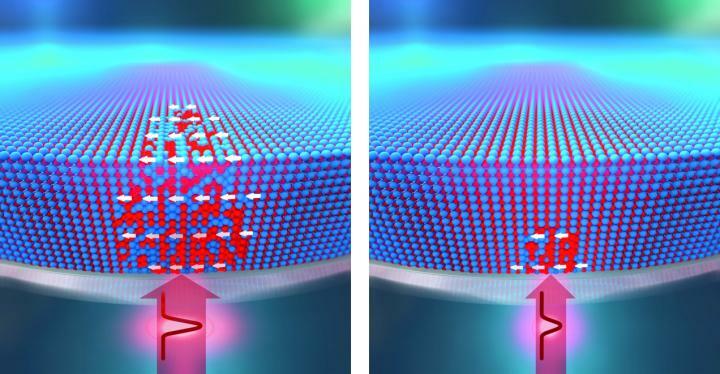 It is interesting as a prototype material because subtle changes to its atomic arrangement can completely transform its magnetic behavior. "The alloy possesses a highly ordered structure, with layers of iron atoms that are separated by aluminum atomic layers. When a laser beam destroys this order, the iron atoms are brought closer together and begin to behave like magnets," says HZDR physicist Rantej Bali. Bali and his team prepared a thin film of the alloy on top of transparent magnesia through which a laser beam was shone on the film. When they, together with researchers of the HZB, directed a well-focused laser beam with a pulse of 100 femtoseconds (a femtosecond is a millionth of a billionth of a second) at the alloy, a ferromagnetic area was formed. Shooting laser pulses at the same area again – this time at reduced laser intensity – was then used to delete the magnet. Working with a team from the University of Virginia in Charlottesville, USA the scientist were able to clarify what happens in the alloy during this process. The simulations of the American colleagues show that the ferromagnetic state is formed when the ultra-short laser pulse heats up the thin-film material to the extent that it melts, all the way from the surface to the magnesia interface. As the alloy cools down it enters a state known as a "supercooled liquid" wherein it remains molten, despite the temperature having dropped below the melting point. This state is reached because of a lack of nucleation sites – microscopic locations where the atoms can begin to arrange into a lattice. As the atoms move around in the supercooled state in search for nucleation sites, the temperature continues to drop. Finally, the atoms in the supercooled state must form a solid lattice, and like in a game of musical chairs, the iron and aluminum atoms end up being trapped in random positions within the lattice. The process takes only a few nanoseconds and the random arrangement of atoms renders a magnet. The same laser, but with a reduced intensity, rearranges the atoms into a well ordered structure. The weaker laser shot melts only thin layers of the film, creating a molten pool sitting on the solid alloy. Within a nanosecond after melting, and as soon as the temperature drops below the melting point, the solid part of the film starts to regrow, and the atoms rapidly rearrange from the disordered liquid structure to the crystal lattice. With the lattice already formed and the temperature still being high enough, the atoms possess sufficient energy to diffuse through the lattice and separate into layers of iron and aluminum. PhD student Jonathan Ehrler summarizes: "To write magnetic areas, we have to melt the material from the surface down to the interface, while to delete it, we only need to melt a fraction of it."